Copper Sinks, Mexican Tile, Bathroom Copper Sinks, Hammered Copper Bathtubs, Copper Mirrors and More! We have an extensive collection of handmade, kitchen hammered copper sinks, bathroom copper sinks, and hammered copper bathtubs. All of these products are made by skilled Mexican coppersmiths. We have a wide range of sizes and designs to meet your kitchen and bathroom decor expectations. You can browse our website for other items such as: Mexican tile, Talavera pottery, Talavera tile murals, mission copper accessories, bathroom accessories and more. Give life to your kitchen with our collection of handmade, hammered copper sinks. Mexican copper kitchen sinks are made following techniques from ancestral times. Modern Mexican craftsmen hammer the copper to get a live piece of art for your home. Fine Crafts & Imports brings high-quality kitchen copper sinks for you to enjoy. We have three different copper sinks finishes: Antique-looking (weathered copper), natural-looking (reddish copper) and clear–looking (smooth brownish). You will find a finish to fit any home decor style. If you are in need of bar copper sink, we got them all too! If you have any further questions, check out our set of frequently asked questions about copper sinks, or copper sinks faqs. Mexican tile is among the most beautiful in the world. It represents a legacy of history, tradition, craftsmanship and creativity. Its origins date back to the old world and historic Arabic craftsmanship. Its main characteristic is its colorful designs, very focused on Spanish/Mexican style architectures, where color is a fundamental component on niches, fountains, bathrooms, kitchens and alike. If you would like to know more on how to install them, take a look at How To Install Decorative Mexican Tile. We also carry our raised Alhambra Mexican tile collection which resembles the famous Malibu tile, featured at the Adamson House in Malibu, CA. Give your bathroom an elegant and stylish touch. Through symplicity, Mexican coppersmiths create this copper bathtub that expresses elegance and style. We have several different models and sizes: Ranging from a large 72" copper bathtub that will easily fit two down to a more conservative 60" model that is designed for a more private, relaxing bath. Check out our entire hammered copper bath tub gallery and choose the one that is best suited for your individual and stylistic needs. Enhance your bathroom decor with our collection of handmade, hammered copper bathroom sinks. The shapes we carry, round, oval, vessel, and round vertical are available in three different finishes: Antique–looking (weathered copper), natural–looking (reddish copper) and terra (smooth brownish). You can select from our collection of drop–ins, under–mounts, and above–the–counter (copper vessels). 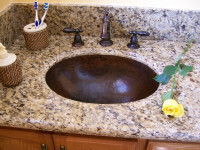 Are you looking for a copper sink and live in Ventura County, CA? We are located in Camarillo, CA. Just 40 miles south of Santa Barbara and 50 miles north of Los Angeles, CA. Our hammered copper mirrors are handcrafted by masters of the trade to bring out the natural beauty in the copper. This simple yet sophisticated piece of art starts out as a chunk of copper which is then transformed using ancient techniques into the mirror you see today. The copper mirrors collection we got are rich in shapes and finishes: You will find them round, oval and rectangularly shaped to fit all of your needs. We have them in weathered copper or natural copper–looking. We got a complete set of patterns, from the single hammered switch plate to the quadrupple hammered switch copper plate, we have all your home decor needs covered. All of our hammered copper switch plates are finished in an array of dark browns that vary from light dark to very dark tones of brown. The copper sheet is heated up to hammer it easily, and when cooled down it gets the reddish nice color characteristic in copper, still visible in the backgroud of our switch plates. 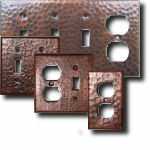 You definitely will enjoy our Mission Style copper switch plates collection. We got a couple of designs in a couple of models of these outstanding copper sunfaces. Either weathered (antique–looking) or natural color (reddish copper), your wall will be enhanced by any of these designs in copper. The models are a simple sunface or a Sun with the Moon (eclipse). Want to know shipping cost? Put the items in the shopping cart, select the button "Shipping Options" located in the bottom–middle part of the shopping cart page. Provide your zip code or for international shipments select your country. We usually ship within two business days after you place the order. 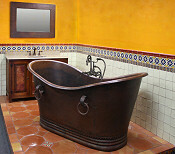 We make custom copper sinks, custom copper mirrors, custom copper bathtubs, custom copper tables. Usually custom work takes about 8 weeks to deliver. We are also able to custom Talavera Mexican tile, Talavera ceramic bathroom sinks and most of our stock items are customizable. Give us a call for a quote. All Rights Reserved. Fine Crafts & Imports, 2002–2018.